August on the Delmarva Pensinsula. It’s no wonder that residents of this beautiful region are so proud of their verdant Maryland landscape! As American Bald Eagles and Osprey soared overhead, our visit to Eastern Neck National Wildlife Refuge offered a constant display of butterflies for us. Butterflies that were as richly colorful as they were varied. Here our Eastern Tiger Swallowtail butterfly is not the commonly seen variety, but instead she is an example of the Black form. Elegance and bearing are terms that she evokes. 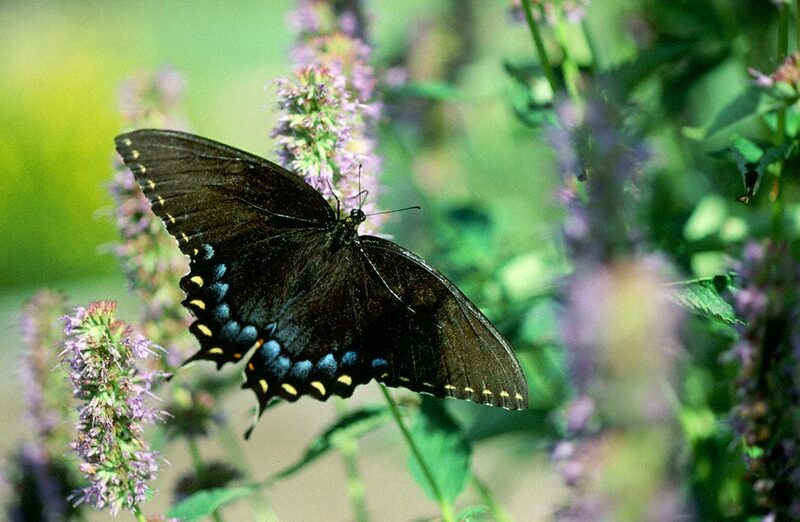 My own experience has been that Papilio glaucus (Black-form) represent some 1% of the tiger swallowtails that we see. Does that match your experience in the field? Does this coloration represent a need to mimic the Pipevine Swallowtail butterfly and gain predator recognition as a distasteful catch? Hmmm. Tiger swallowtails nectar actively. She’s busily doing so in the lush Bayscape Garden that is painstakingly maintained by a core of friendly volunteers. The nearby town of Rock Hall is a pretty place, with its small harbor and time stood still look. What will her progeny look like? Black and yellow butterflies. For those of you who are still in school, there’s a whole lot of research needed to be done before we better understand how this all works. Lucky are the students who who seize this opportunity! I’d say the black form is more common in this area of NW FL. I’m always thrilled when I see the yellow form.